In the first picture we see the initiation of the throw. What we would normally consider the sidekick is actually placed between the opponents’ legs, and past them. This allows the extended arm to hook on the upper body in any number of places.In the second picture (at the apex of the throw) the leg is fully extended and the throwers body is beginning to turn to the rear. At the completion of the throw he will be facing the rear in exactly the low stance that we see in the form.Not only does this interpretation make sense within the movements of the poomse, it also makes sense combatively. No longer are we faced with a difficult explanation as to why someone would behave in that manner.I believe the serious practitioner should take a hard look at the various spins and turns found in many forms, and begin to think of them in other ways. both hands to the hip (contrary to extending the arm). at the last kick in Pyongwon). thank you for your interest. 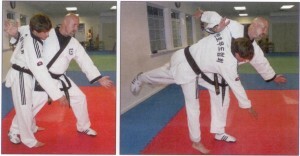 i have seen (in 40+ years) many variations of the descriptions as to how side kick are to be “chambered” and executed. your point is well taken. these are written in the hopes that others will begin to look deeper into these movements and derive workable solutions.